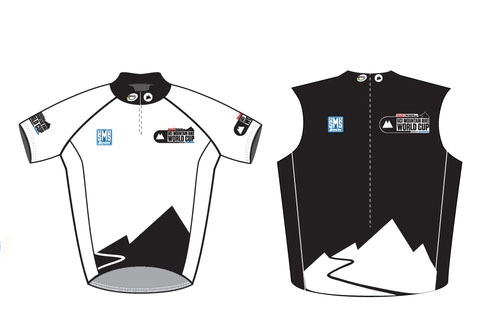 The leaders of the 2012 RockyRoads UCI Mountain Bike World Cup presented by Shimano will be identifiable by the new-look leaders’ jerseys introduced for the upcoming season. In the cross-country competition, the leaders of the Elite and Under 23 categories will race in a short-sleeved white jersey (left on the photo). Meanwhile the leaders of the downhill competitions will wear sleeveless vests – black for the Elite riders (right on the photo) and white for the Juniors. These jerseys are in keeping with the World Cup’s new visual identity for 2012. The first round of the 2012 RockyRoads UCI Mountain Bike World Cup presented by Shimano will take place in Pietermaritzburg (RSA) on March 17th and 18th. The series comprises 10 rounds, finishing in Hafjell (NOR) on September 14th and 15th.